Following the attack on the French newspaper Charlie Hebdo, there has been a lot of support from other countries’ governments and politicians. And there were also reactions and sympathy in Finland. “I strongly condemn the horrific shooting at the offices of Charlie Hebdo magazine in Paris that has reportedly killed 12 people. Our thoughts and prayers are with the victims of this terrorist attack and the people of France at this difficult time. France is America’s oldest ally, and has stood shoulder to shoulder with the United States in the fight against terrorists who threaten our shared security and the world. Time and again, the French people have stood up for the universal values that generations of our people have defended. France, and the great city of Paris where this outrageous attack took place, offer the world a timeless example that will endure well beyond the hateful vision of these killers. We are in touch with French officials and I have directed my Administration to provide any assistance needed to help bring these terrorists to justice.” This was followed by new statements in the afternoon. After multiple statements from the Kremlin, M. Medvedev, and the ministry of Foreign Affairs “condemning the terrorist act in Paris, expressing condolences to the next-of-kin, and indicating that the tragedy proves the need to continue active cooperation in fighting the terrorist threat“, President Putin was calling President Hollande to convey his most sincere condolencesand the people of France regarding the terrorist attack on Charlie Hebdo magazine’s staff. In addition, according to the Kremlin, “President Putin condemned this act of barbarism and expressed hope that all of its perpetrators will be found and duly punished. He asked Hollande to convey the words of deepest sympathy to the families of those deceased and wished a speedy recovery to those injured”. For Germany, Chancellor Merkel, in a meeting in London with Prime Minister Cameron, sent a letter of condolences and, with david Cameron, called President Hollande . She declared later “What has happened in Paris today is indeed a barbarous attack against all of the values we share. All of us that live in Europe strongly condemn these attacks and our thoughts go out to the French people and particularly to those who have lost loved one in this horrendous attack. This is an attack against the values we all hold dear, values by which we stand, values of freedom of the press, freedom in general and the dignity of man. And again our thoughts are with the French people with all of those who have lost loved one in this horrific attack and everything we can do to help the French we will certainly do“. All other countries have made declarations and sent messages of support, in particular China, Australia, Norway, Lebanon, India, Japan, South Korea, South Africa, etc. Some of the interventions are politically significant: Mahmoud Abbas, for the Palestinian Authority sent a telegram qualifying the attack as a “heinous crime[…] condemned by morality and religion”. “The president expressed to the French President and the French people, friends of Palestine, and the families of the victims, our condolences, begging mercy for the souls of the victims, wishing a speedy recovery for the injured, and patience and courage to their families“. In Egypt and Saudi Arabia, similar messages were sent, with in particular a Saudi official qualifying the attack as a “cowardly terrorist act which Islam as well as other religions reject“. In Finland Prime Minister Stubb published the following message: “Prime Minister Alexander Stubb has expressed his condolences on behalf of the Finnish Government following the attack at the Charlie Hebdo magazine’s office in France. Prime Minister Stubb offered his condolences also to the French President, François Hollande. Finland strongly condemns all acts of terror“. The Prime Minister added that “Freedom of expression and a free press are integral elements of European values“. President Ninistö published the following statement on the Presidency’s website: ” President of the Republic Sauli Niinistö sent a message of condolence to François Hollande, President of France, on the attack on the offices of the magazine Charlie Hebdo in Paris on Wednesday 7 January 2014. President Niinistö expressed his condolences on his own behalf and on the behalf of the people of Finland to the family and friends of the victims and to the people of France. “Finland condemns terrorism in the strongest terms. Freedom of speech and freedom of the press are fundamental European values,” said the President in his message“. The website of political parties, very busy with the parliamentary campaign, did not convey messages of support or solidarity. For Keskusta, there is just a link to the Suomenmää publication where an article analyses the freedom of the press. On his blog, no reaction from Juha Sipilä. For the Greens, there is no official news post on the site, but a number of tweets such as Pekka Haavisto’s writing in different languages: “Remembering the victims of the ‪#‎CharlieHebdo‬ attack. Votre chagrin est partagé avec vos amis en Finlande.” The Left Alliance (Vasemmisto) is linking with online newssite Kansan Uutiset Verkkolehti where an article analyses the event, but does not express support. I did not find anything on the Kokoomus website, but it may be hidden somewhere, and the same strangely goes for the SDP (Social Democratic Party). Neither Antti Rinne or Jutta Urpilainen seem to have reacted. For the Finns’ Party (Perussuomalaiset), there is an article on Timo Soini’s blog which is a balanced reflexion on the event: “An attack took place in Paris, and a satire magazine has been severely hit. There is no justification for this action. It was cruel executions. Human life can not be abolished under violence. Freedom of expression has now more martyrs […]. This attack shows that terrorism is not happening out there somewhere. It is a global problem for the world […] It is your problem and my problem, at our door.” But there are already other people in the party using the event for supporting their views about immigration, as it is already the case in France with Marine Le Pen. It is true that Finnish politics is probably these days more oriented on internal problems and politics, so the reactions are limited, even if the newspaper have been quite active. In Sweden, there is a press release in good position on the websites of the the Social Democratic Party and of the right-wing Demokraterna (not the Greens and Center pParty)) and on the personal blogs of political leaders. However, there are some exceptions in Finland in the young generation. In particular, there was at 4.30 pm today a meeting in front of the French Embassy, where the Finnish association ARX-Antirasismi X has invited all people, organizations, communities and networks to honour the memory of the victims of the terrorist attack and to show their opposition to violence. 200 people came and one Finnish politician, Maria Ohisalo, leader of the Young Greens, was present . You can find Helsingin Sanomat video here with her declaration. 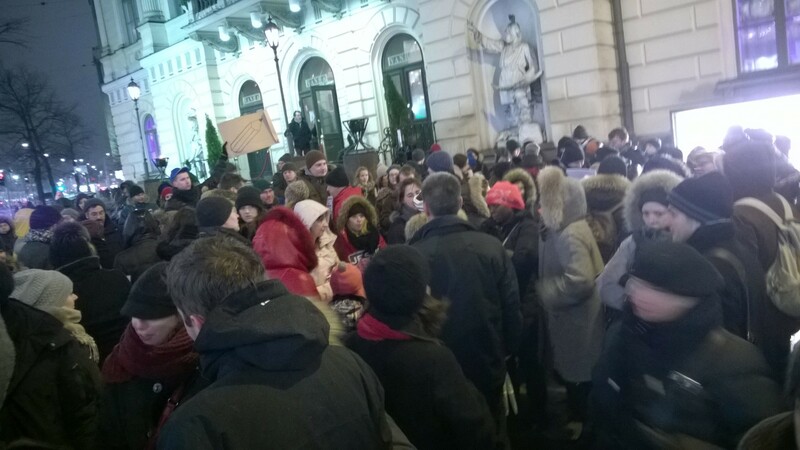 Later, around 6 pm, there was another demonstration in the Centre of Helsinki, with around 150 persons walking peacefully from Mannerheimintie to Senate Square to support Charlie Hebdo and tell about their sorrow for this dreadful event.